Ron Mathers sitting at a desk.working on a document. 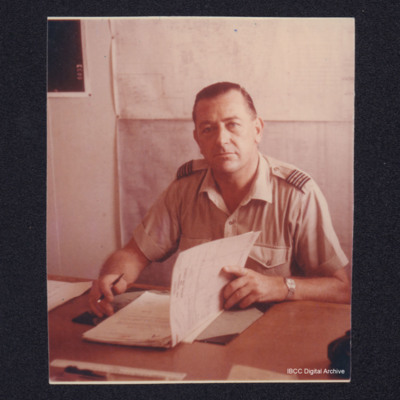 He is wearing tropical airman's uniform with the rank of Wing Commander. Six airmen wearing side caps are standing in front of a Lancaster. 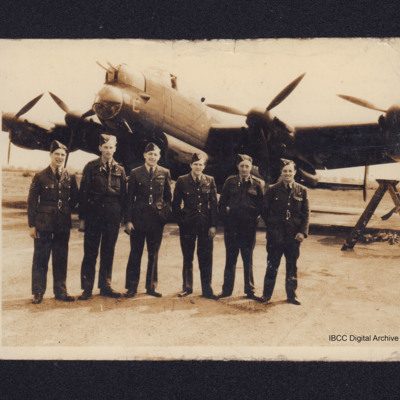 On the reverse they are identified as 'Jock Rear Gunner, Tom Navigator, Me Skipper, Al Engineer, Paddy Mid-upper Gunner Jock Wireless Operator'. 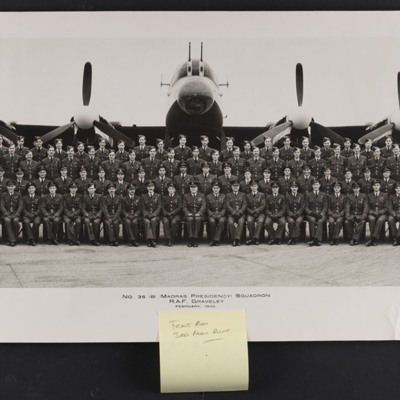 Four rows of airmen arranged in front of a Lancaster. 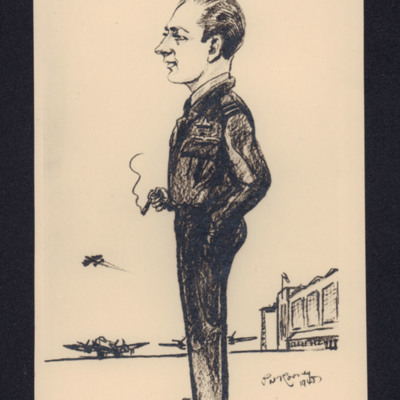 It is captioned 'No 35 Squadron (B) (Madras Presidency) Squadron R.A.F. 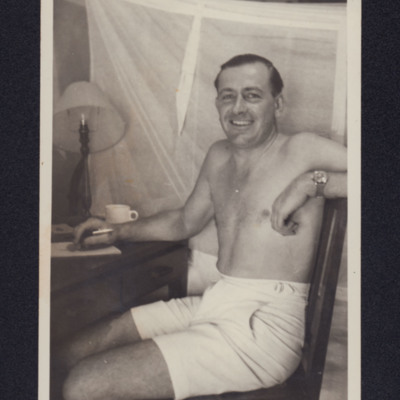 Graveley February 1946.' Ron Mathers is front row third from the right. 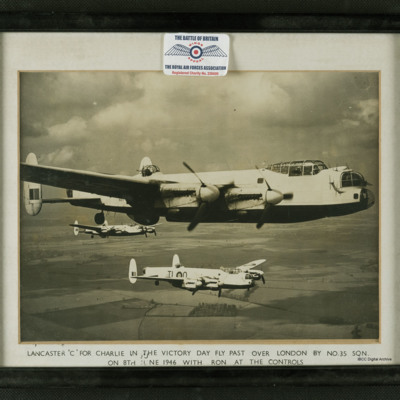 An air-to-air photograph of three Lancasters captioned 'Lancaster "C" for Charlie in the Victory Day Fly Past over London by 35 Sqn on 8th June 1946 with Ron at the controls'. Item 1 is a newspaper cutting marking the return of the Lancasters to Graveley. 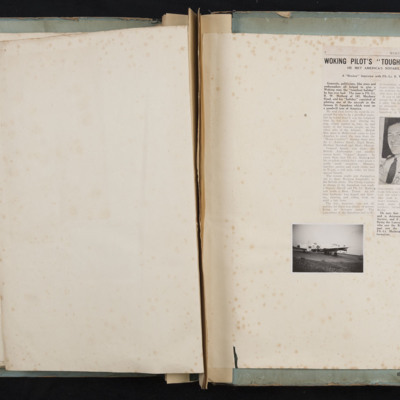 Item 2 is a newspaper cutting titled 'Goodwill' showing 11 Lancasters over St Paul's Cathedral. Details on Anne Clough service in the Women's Auxiliary Air Force during the War. 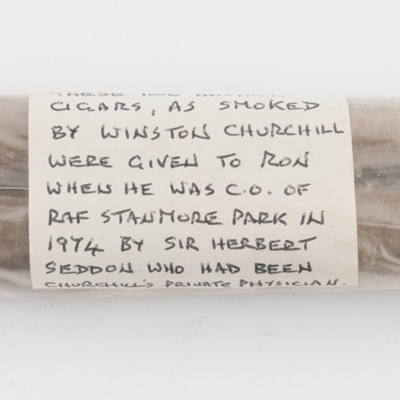 Item 1 is a formal invitation to Flight Lieutenant Mathers to attend a reception at the British Embassy. Item 2 is a leaflet about La Villita, the little Spanish town of San Antonio. Item 3 is a photograph of a building, captioned 'Spanish Governor's Palace'. A sketch map of Texas showing the state disproportionately large, captioned Mayan Guest Ranch, Bandera, Texas. Underneath is text referring to points of interest in San Antonio and missions within the state. Head and shoulders photograph of Rita Hayworth, signed 'The best of luck -always Rita Hayworth'. 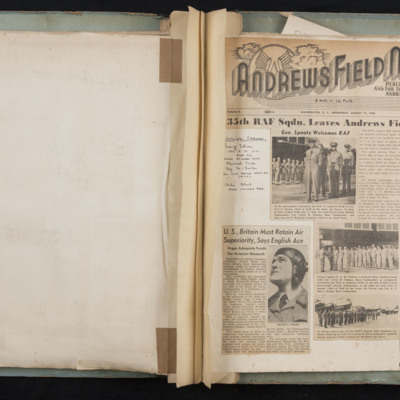 Item 1 is a newspaper cutting about the airmen visiting studios and recreation centres. 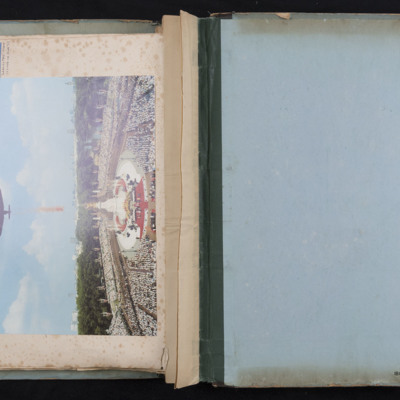 Item 2 is a photograph of three men and two women, captioned 'Some of the stars about town'. 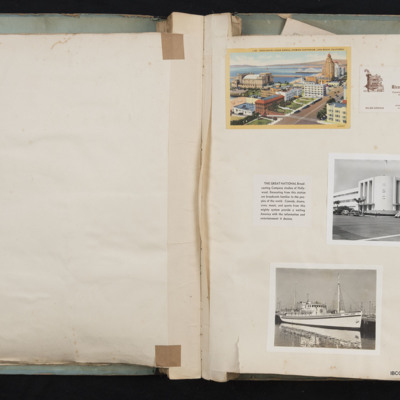 Item 1 is a card with an aerial view of Ocean Avenue, Long Beach. Item 2 is a card for Ricarts Restaurant at Long Beach. Item 3 is a photograph of the National Broadcasting Company studios. Item 4 is a photograph of a yacht at the quayside.